It’s almost here! It’s almost here! We’re just two days away from the beginning of Dewey’s 24-Hour Read-a-thon. I’ve participated in this event almost every time that it’s been hosted and I can’t wait to participate again. 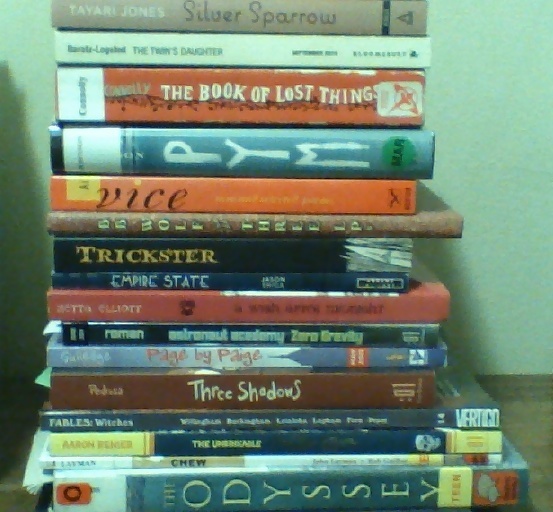 I figure today is the perfect day to post my read-a-thon stack and a few tips for those of us participating in the event for the first time. If you haven’t already signed up, it’s not too late. Tip #1 – Pick out a few books days in advance so you’re not running around after the start of the event, looking for something to read. I usually pick out the same sort of books every read-a-thon because I know which genres work for me during this time. Tip #2 – Include short books in your read-a-thon stack. I always tell people that the read-a-thon isn’t a race or contest of any kind, but your competitive side is sure to come out just a little. If you’re on your second book and you see that someone else is on their fifth, you might feel a little bad funny about your reading speed. It’s nice to read your short books at the start of the event so you can feel like you’re off to a great start. Tip #3 – Be sure to include different genres in your stack. During every read-a-thon event, I make sure to have a book of poetry, picture books, graphic novels, and a short story collection in my reading pile. Why? Because after reading a book or two of the same genre, I need something different to keep going. I don’t try to read a whole poetry collection in one day but reading a few poems or short stories between books is a great change and it almost always work. For this weekend’s stack, I’ve included the poetry collection Vice by Ai. I’ve also have a ton of great short stories that I’ve found on Tor.com’s website. Poets.org is a good place to read poetry online. Tip #4 – Be sure to include different formats in your stack. This tip is here for the same reasons as tip #3: variety is good. This will be my first read-a-thon using an e-reader. I also have a few audio books ready just in case I go on a walk or need to rest my eyes. Audiobook Jukebox is a website to visit for audio book recommendations. Tip #5. Have your refrigerator stocked with healthy snacks before the start of the event. During one of the first read-a-thons that I signed up for, I ate massive amounts of junk and paid for it later on when I crashed from my sugar high around hour 12 and didn’t wake up until after the read-a-thon ended. It’s just smart to include healthy and quick snacks that you can eat without much fuss. Tip #6 – Naps are great. Seriously. Tip #7 – Let your family know in advance of your plans. Since I’ve participated in the read-a-thon so many times before, my family knows that it’s my day. If I don’t mess with anyone while Spongebob/football/HGTV is on, my family knows not to bother me during the read-a-thon unless they have to or if I’m taking a break. Moms need me-time too. Tip #8 – Have fun. Dewey started the read-a-thon to have fun and you should have fun too. If you want to disregard most of my tips, please do but not this one. If you would rather read just YA paranormal fiction the whole time, do it. Want to just read a chunkster? Do it. Don’t put any pressure on yourself. Are you participating in the read-a-thon this weekend? Any tips you think I should add to the list? Next It’s Time for the Read-a-thon! These are great tips and your selection is wonderful too! I so want to be able to participate in this, but alas, it’s not to be this year. Hopefully I can stand firm next year and get to do what I really want, instead of something totally obligatory. Hey I am doing the read-a-thon too, I think this will be my 5th! I will keep your blog in my favs and come visit you during. Good luck! Wow, I didn’t realize this was so close! I need to get some food and make a list myself! I’m going to steal some ideas from you and add Walker Bean to my list as well as A Wish After Midnight. I’ve had the Elliot for over a year and it’s time I broke into it. I’m going to add a few more graphic novels as well as The Silver Phoenix. Good luck and thanks for the heads up! Can’t wait for this weekend! Hope it’s a great day. These are dreat tips, and I see you have several graphic novels in your stack! Good luck with the read-a-thon! Great tips! I know I will be utilizing quite a few of them! Can’t wait for Saturday to roll around. What a great looking stack of books! Great tips, too. Looks like a great assortment of books! Enjoy! Will keep all your advice in mind for the future. I’m hoping to participate in either October or April of next year. Great tips (especially #6)! This will be my first read-a-thon and I’m really looking forward to it. I can’t wait to hear your thoughts on Trickster!!! Great stack! It is definitely a good idea to have a LOT of options. i love this post and i’ll have to come back and refer to it when i decide to participate in a read a thon. i really should participate just so i can take my tbr pile down a notch, but i have too much to do this weekend to sit around and read all day. you have a great looking stack of books to read though! hope you have a blast reading them all!! I can’t wait for the readathon. I’m trying to get most of my homework done tonight so I can read guilt free. We’ll see how that goes-haha. I usually read MG and YA books during the readathon but this time I’ve got a stack of short novels. I agree, it’s great to finish a short book early in the day to make you feel like you’re off to a good start. This is the first readathon of these readathon’s that I haven’t been excited about and I even was involved in the last few in some capacity or another. Reading doesn’t even figure in my plans this weekend. Too many other good things going on I guess. You have it all nicely planned! I agree with all your tips. I learned it the hard way during my first readathon. Have fun! I’m not sure of my weekend plans so officially, I’m not participating in the readathon, but unofficially, I’ll be coming by to cheer y’all! I’m getting so excited about the read-a-thon. I borrowed a bunch of international graphic novels the other day, and I’ve got a few short, high-interest prose novels that I hope to get through, too. I’ve also laid in plenty of snacks (unhealthy ones, I fear), and worked out a sleep schedule so I can get up at 1am and start the ‘thon alongside everyone else. I’m currently downloading a new audiobook, too, so I can turn in that direction when the need arises. Thanks so much for stopping by my post! I’m so excited for my first read-a-thon tomorrow. My start time is 7:00 AM. Better get to bed soon, lol!